Ricks (Sizemore) is the commanding officer for SEAL team 8. He sends his boys, led by Case (Shrapnel), to the Congo in Africa to uncover the illegal sale and mining of yellowcake uranium which is controlled by an evil African warlord and his goons. While fighting their way through them, they rescue a hostage named Zoe Jalani (Meriel) who turns out to be handy with a gun and proceeds to accompany the team on their mission. Along the way, the team gets involved in many shootouts and scrapes…but who is really behind the nefarious uranium deal? Seeing that they are BEHIND ENEMY LINES, will anybody be coming to their rescue? What will happen to SEAL TEAM EIGHT? 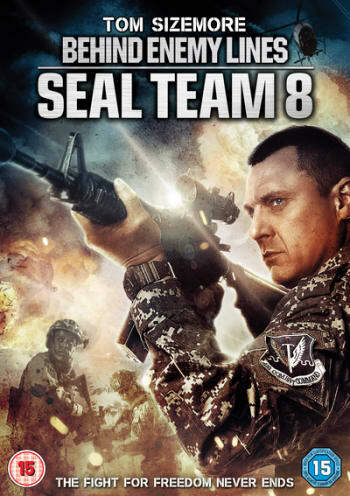 Let’s see if we can sort this out: SEAL Team Eight is not the eighth sequel to the franchise, the eight refers to the number of the SEAL Team. This is actually the fourth installment in the Behind Enemy Lines franchise – but has nothing whatsoever to do with the Thomas Ian Griffith film from 1997. Assuming all the above information is correct – and that anybody cares – we may proceed. Sure, there are a lot of blow-ups, firefights, and modern-day war movie setpieces, but the problem is that we as viewers are not invested all that much because there is nil character development. Who are these people? We never get to know them. Maybe it’s assumed we know them because this is a series – but these characters aren’t in the previous entries, so that theory’s a bust. Much like the American Heroes series, or the latter-day Sniper sequels, there is a lot of military jargon being said in between (and during) the war sequences. Maybe it’s so the movie can seem authentic, but they should have concentrated on character development instead. And while there does seem to be some CGI blood, bullets, and even drones, it appears to be mixed in with the practical, real stuff as well. And don’t be fooled by the SEAL Team moniker; this is actually an Africa Slog. Though, to be fair, the movie is shot well and the African locations we always seem to be slogging through look better than ever. Speaking of locations, the movie really picks up steam when we move out of the African countryside and into the streets of the city. The urban sequence was by far the best in the film – they should have kept the whole thing in a gritty city environment. Perhaps it’s just our preference, but if you see the movie yourself you will probably agree. Even if you don’t, there are plenty of African dudes screaming while shooting machine guns, and we can all agree on the entertainment value of that. 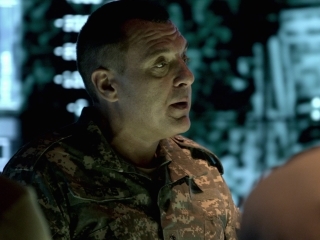 Thankfully, Tom Sizemore is here to perk things up. While he mainly paces around the command center and looks at screens of what’s going on, he has a great voice that is fun to listen to. Once again, do not be fooled by the box art – Sizemore himself never picks up any firearms and gets into the action. He’s pretty much just the focal point for the team. His co-star Lex Shrapnel has a great name, but like the Sniper sequels’ Chad Michael Collins, is a bland and faceless hero and easily forgettable. The main problem is that we’ve seen this type of thing a million times before. It’s not bad, per se, and it is very professional, but it needs something to set it apart. Take Act of Valor (2012) for example. That had the novel idea of using real Marines instead of actors. This movie needed something like that – although they did seem influenced by it; there’s a very similar boat chase. The director, Reine, seems to specialize in DTV sequels, last exemplified on the site with Hard Target 2 (2016). This sort of stuff seems to be in his wheelhouse, and it’s executed well enough, but it lacks drama and heart. We found this movie at Big Lots for three dollars – on Blu-Ray no less. If you can find it under similar circumstances – and you like the modern-day DTV war movie – we say pick it up, but keep your expectations low. And perhaps be prepared to trade it in at Game Xchange or a similar store near you.